The argument for games as a form of art has long been settled (spoiler alert: they are). As more and more developers choose to make beautiful and profound experiences, new ideas and approaches enter the PS4 library with each passing week. 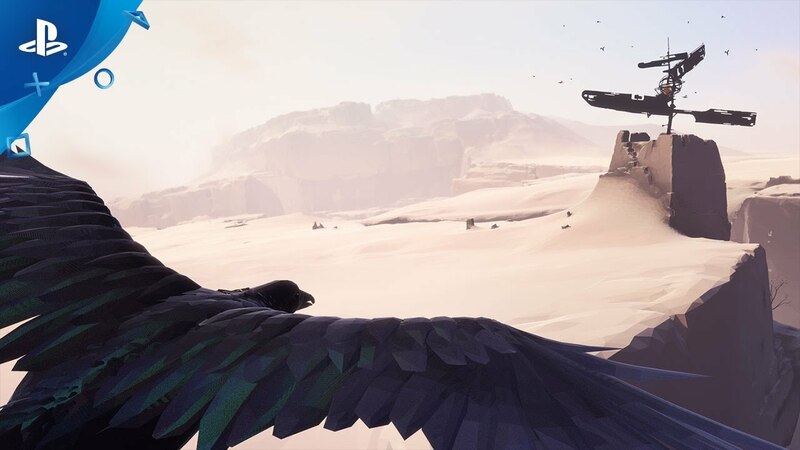 Vane is a title for PS4 that showcases a wonderful art style and the promise to tell a story without words. It looks great in motion, but how does it play, and more importantly, how does it rank among the masterful titles within its genre? It’s time to find out if Vane soars high or if this bird is in for a crash landing. Vane immediately grabs your attention with its vast open areas and the unique art style that gives everything a shimmer like the surface of a painting. You start the game with a pulse-pounding sequence that transitions into a calmer segment. In the first sequence, you’re a person, but in the next you’re a blackbird perched upon a barren tree. As promised, there are no words to explain what has transpired. Instead, you’re simply instructed on how to flap your wings and fly out into the vast desert before you. It’s refreshing at first. Not being tied down to a fixed path allows you to soar, dive, and explore to your heart’s content. The controls are simple enough, but the camera quickly proves to be an erratic element. At times, the camera pulls in close to frame a great shot, but it fails to pull back out when you’re making quick movements, which creates a jarring sense of motion if you need to make a tight turn or decide to dive for a boost of speed. This opening segment in the desert also highlights some of the problems with Vane’s wordless storytelling. There’s no real direction on what to do next. Now, normally this wouldn’t be an issue, but Vane’s opening area is so incredibly vast that wonder and exploration quickly turn to frustration as you hunt down the next step in your journey. Even knowing what to do will still leave you with the task of finding specific elements in the vast desert before you. This problem becomes less of an issue as you progress into the game, thanks to smaller underground areas where you transform between a child and the bird to solve puzzles. The problem creeps up again in the final acts, however, as you’re once again in a large environment with zero guidance on what to do next. There’s something to be said about the freedom of wandering and exploring at your own pace, but at a certain pace even this sense of wonder wears off. Movement as the child is a little floaty, but I found the basic platforming and puzzles to be fine, even with the lofty controls. In total, Vane will last you about four hours or so, but this could easily be longer if you ignore walkthroughs or become lost trying to progress. The wordless storytelling is interesting, but it leaves far too many questions unanswered about the nature of the world, your journey, and the meaning of it all. That’s not to say that stories require words, but Vane would have benefited from more cutscenes and events that flesh out the world. As an artistic adventure, Vane succeeds in conveying both mystery and intrigue, but the sheer lack of guidance and issues with both the camera and controls stop it from being a true masterpiece. Vane is wonderful from a visual perspective. The game never quite reaches the same visual high as that opening desert segment, but there are some contenders later in the game that will offer a treat for the senses. The soundtrack is a standout element here. Where most games like this lean on an orchestral selection of sounds, Vane instead chooses to provide a rhythmic soundscape filled with synthesizers and percussion. The thumping rhythms and vibrant notes add a sense of eeriness and uncertainty to the gameplay, which does a great job of fueling the game’s atmosphere. Ultimately, Vane has a lot of great elements, but the lack of a strong emotional hook or truly compelling gameplay left me wanting more from this journey into a beautiful and haunting world.